Building on the success of the Omission brand, launched last spring in the form of a gluten-free pale ale and lager, the Craft Brew Alliance has introduced Omission IPA. They held a launch party Wednesday evening at the Hawthorne Hophouse to celebrate the occasion. The beer began showing up on shelves in Oregon on April 1. National distribution is set for early August. Like Omission Pale Ale and Lager, the IPA is brewed with traditional ingredients. Brewers then use a proprietary process that reduces gluten to well below the CODEX standard of 20 parts per million (ppm) for food and beverage. Every batch of Omission beer is tested by an independent lab for adherence to the standard. 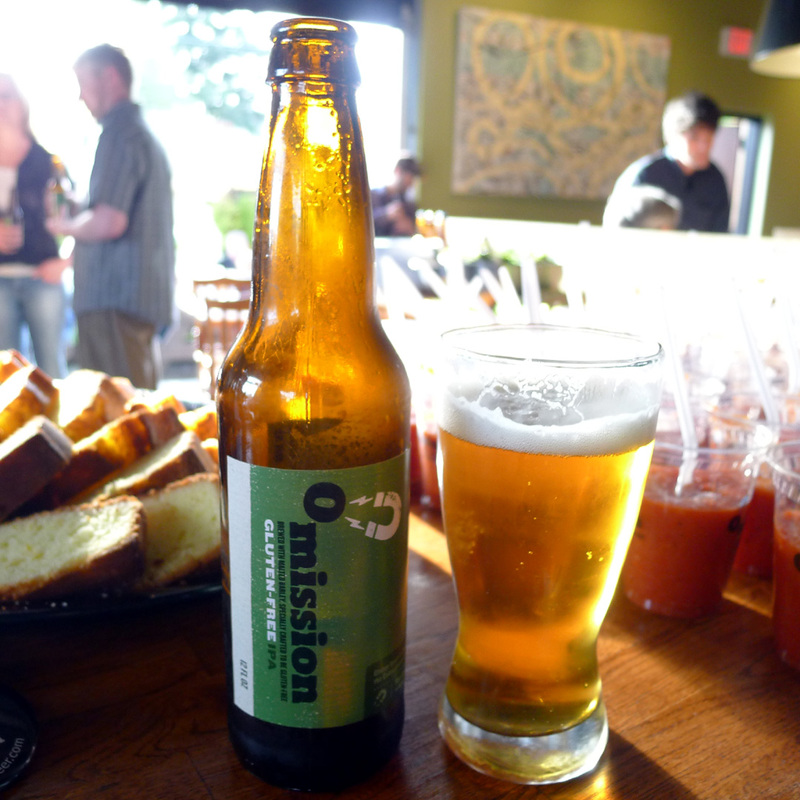 The CBA is positioning Omission IPA as the first gluten-free IPA brewed with authentic ingredients. There are certainly other gluten-free IPAs out there...such as Harvester IPA. But the base of that beer is made with roasted chestnuts, gluten free oats and tapioca maltodextrin. Not exactly standard, obviously, and apparently common with gluten-free beers. In case you're wondering, Omission IPA is pretty good. It pours light copper in color with a lovely head that doesn't linger quite as long as I might like. Brewed in the style of a Northwest IPA, it leans on Cascade and Summit hops. I found the aroma drifted away rather quickly, leaving a beer that is crisp and mildly bitter with nice citrus notes. The PR gals who were greeting everyone came up with the idea of tasting Omission IPA next to a standard IPA. They chose Boneyard RPM, an interesting choice, I think. The two beers have close to the same stats...6.6% ABV and 50 IBU for RPM; 6.7% ABV and 65 IBU for Omission IPA. RPM clearly has more body, aroma and flavor, courtesy of aggressive dry-hopping. But the Omission held up pretty well, I thought. The more informative test would be to taste Omission IPA next to some of Widmer's Rotator IPAs. That's an appropriate comparison and I think the Omission would do fine. I am not gluten-intolerant, so I do not have to seek out Omission or other gluten-free beers. The question you always have to ask in this situation is: Would I drink this beer if I didn't have to? The answer hinges largely on price. If I'm choosing between O'Ryely IPA at $8.99 a six-pack and Omission at $9.99 a six-pack, I'll take the O'Ryely. However, for people who can't choose the O'Ryely, the Omission is a nice option. As noted at the top, Omission IPA is currently available only in Oregon. Production will ramp up to support a national release through the CBA's partner, Anheuser-Busch, in August. There's no mention of it in the media materials, but I assume Omission is the first gluten-free brand in national release. The IPA is a nice addition, given the popularity of the style. My only question is what's next? Gluten-free ESB? Gluten-free Hefeweizen. Inquiring minds, you know. I'd vote for gluten-free ESB!